It takes some drilling down to see where the new Microsoft Windows 2000 operating system diverges from its Windows 98 and NT 4.0 predecessors [GCN, Feb. 7, Page 1]. Sure, it looks like Win 98 and acts like NT, but when it comes to the administrative tools, Win 2000 is all new. ''Launch the Event Viewer application to check logs for any alerts. ''Double-click the Services icon to launch another application showing the services running and those available. 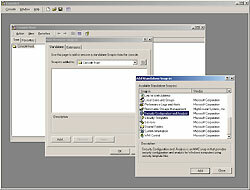 ''Start the User Manager for Domains application to add or remove users or change their rights. ''And finally, start yet another application to manage hard drives and other storage components. With RunAs enabled, the administrator can simply launch an application with administrator rights'giving a log-on password'and make the changes on the spot.